Who are the founders of ISIS? We all are. Last week, Donald Trump repeatedly declared that Barrack Obama and Hilary Clinton are the “co-founders” of ISIS, and the U.S. news cycle predictably clicked into a familiar pattern. Fact-check. Feature Trump supporter-explainers like Rudy Giuliani. Denounce yet more defensive posturing from Trump, all while lavishing on him the attention they claim not to want to provide. Repeat. But pausing that for a moment, let’s use this as a chance to explore the question of ISIS’ founding more seriously. Now the tragic phenomenon of ISIS is complex. Grasping it requires a deep understanding of the region it is concentrated in, as well as a nuanced approach to global politics and power. Yes, clearly, the U.S. invasion of Iraq in 2003 triggered a series of catastrophic events, most crucially the sectarianization of Iraqi society, which is intimately tied to the formation of ISIS. It is also true that Syria’s Bashar al-Asad released hundreds of right-wing Islamist fighters from prisons in 2011, which fed into the ISIS phenomenon. Then when it began gaining territory, Asad actively avoided fighting it, in a clear attempt to focus his fire on the original mass-based, democratic opposition to his regime, and to convince the world that it was either him or the terrorists. This is not to speak of the even broader context: the daily barrage of hateful tweets penned by anti-Shi’a clerics often based in and depending on the Gulf. (ISIS’ “theology” after all, is an extreme reverberation of the Western-backed, ahistorical ideology that kingdoms like Saudi-Arabia have been exporting for decades.) This is in addition to direct armed intervention by Iranian-trained militias and Hezbollah, backing beyond-repressive regimes in both Syria and Iraq. These dynamics have and continue to fuel the divisions and sectarianism on which groups like ISIS thrive. The most central founders of ISIS though, are the unanswered demands of popular protest movements both in Iraq and Syria, and the lack of a global solidarity movement that would be capable of broadcasting and working in concert with those calls for freedom and justice. Late last year, scholar of Islamophobia Arun Kundnani wisely wrote that “ISIS exists because the Arab revolutions of 2011 failed.” This insight is particularly applicable in both places ISIS was able to gain its deepest footholds. In revolutionary Syria of 2011, areas claimed by the armed opposition — often controlled, at least at first, by democratic-minded leadership — were overrun by a much better armed right-wing element, and swept in after the hard fight to liberate territory from Asad’s army had ended. This dynamic was closely mirrored in Iraq in early 2013 when popular protests began denouncing the sectarian nature of the Iraqi government, which in reality served very few ordinary people of Iraq, whether they be Sunni, Shi’a, Christian or other. 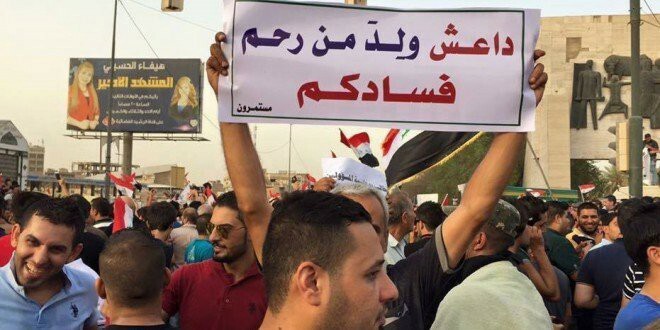 More specifically, the protests were aimed at the dramatic spikes in arrests and detainments of both men and women in Iraq’s western cities and towns. As months passed, these protests devolved into an armed rebellion due to shrewd manipulation by Ba’athi hold outs and right-wing Islamist forces (the remnants of al-Qaeda in Iraq). It was in this way that the progressive forces — women’s groups, labor unions, and protest leaders that had been part of the massive 2011 protest waves all over Iraq, and were participating in or supporting this new surge in 2013 — were sidelined. They simply couldn’t compete when violent raids by Iraqi security forces killed dozens by April, closing all channels of nonviolent and popular dissent. Violent suppression of these rights-based demands, combined with a media and solidarity black out in the U.S./West, are central dynamics that got us to where we are now. I say this out not to make an abstract moral point, or to wax nostalgic about the Arab Spring and Iraqi nonviolent protesters. Rather it is to ask: when future reactionary forces appear, and more importantly, when just demands that precede them ring out, will we be ready? Clearly people like Trump will be.